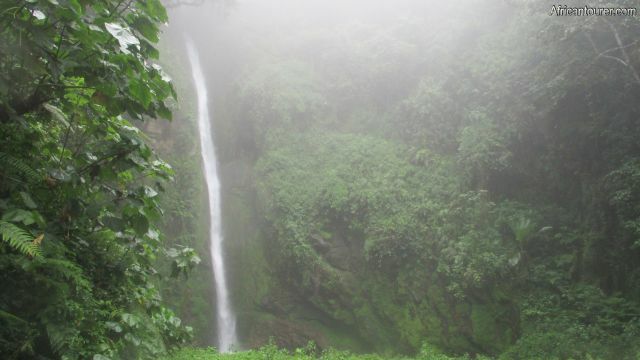 The cave falls are a waterfall as well as one of the many water sources for the Arusha Urban Water Supply Authority that are located just a short distance inside the Arusha national park and on the slopes of mount Meru - Tanzania. They also serve as one of the tourist attractions in the region but there are some strict regulations regarding visitations to the area - requiring a special permit from AUWASA or the use of a tours and travels company. The falls are located inside a large enclosure filled with trees and greenery - much like a cave that is open on one side and at the top. The water comes from a small river that originates higher up in the mountain, before reaching the top of the cave and falling over 30 metres into a small plunge pool, before being carried off down the mountain. But unlike others we've seen, these falls are narrow - much like water from a tap making a constant but loud gushing sound as it hits the plunge pool. 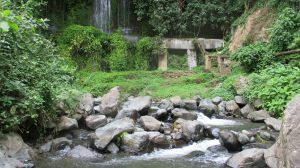 This plunge pool also serves as a catchment area for AUWASA, with a large concrete dam like structure funnelling it into pipes that carry the water down hill unaided by machinery. What to do there ?Hike to the place and admire it's beauty. As it is a valuable water source, no swimming or any kind of activities which may contaminate the water is forbidden - one of the reasons as to why you need a special permit or a tour company to take you there. But take it from us, the place and it's surroundings are stunningly beautiful, well worth any trouble you may have getting there. If you do take the longer hiking method of getting there, then this would put you in touch with the locals, taking you through several rural homes and villages where you could have a bit of extra activities depending on your tour guide or company. One interesting thing to see would be how the farming as well as animal husbandry is done in this areas. Best time to visitAny time not in the rainy season of March to June. Although it still is possible to visit this area during this time - especially by hiking, the trails through the village would most likely be muddy and the views limited. 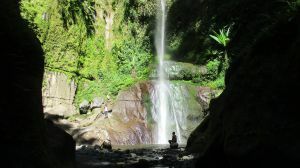 The cave falls are located just a short distance inside the Arusha national park and thus a TANAPA - zone. 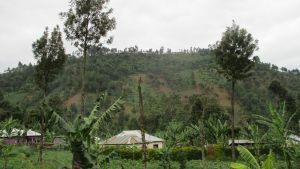 They also are just a short distance from the city of Arusha and in a rural area on the slopes of mount Meru, although there is no climbing route on this side (yet). 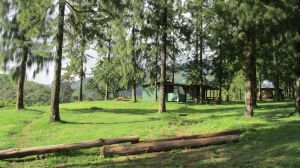 Nearby are a few villages, a pine tree plantation as well as a water treatment plant for AUWASA and as it is at a high altitude, most mornings are foggy and the vegetation is almost always evergreen. Even when the rest of the city may be dry, this area may still receive rain. For more information on its location, please see the map below (click to start). How to get there?There are two ways to get to the falls, by hiking or by vehicle, although there still will be some hiking regardless of which method you choose. 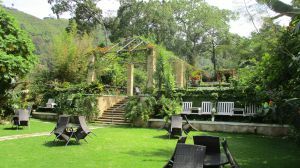 By vehicle you would have to first head east from the city of Arusha, along the Arusha - Moshi highway then turn left at the Saiteru petrol station - located just about 200 metres before the snowcrest hotel. From here, use the map to get there. Once you have gotten through the villages by either vehicle or hiking trail, there is a final kilometre or so which you would have to do on foot that takes you through a pine tree plantation and into the Arusha national park itself - a rather steep climb before a short descent into the enclosure or cave itself. The roads to the place are all seasons dirt roads, so no worries about the type of vehicle to use; However, the last bit is does require a good 4x4 vehicle and may be impassable during the rainy season. Are you associated with Cave waterfall? Contact us to improve this page or create another page for your business.